CavinKare, the diversified FMCG conglomerate has yet again created a landmark achievement with the launch of Spinz Brightening and Beauty Talc. The revolutionary product created after a thorough and extensive research infuses a breakthrough formulation for women’s facial needs, thereby making it the world’s first BB talc product for the face. 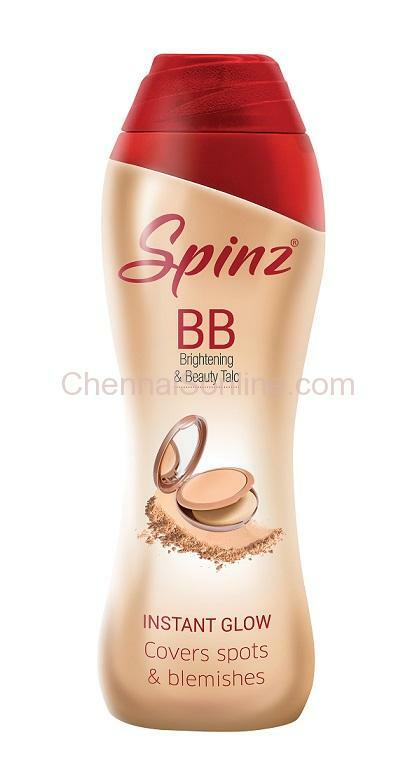 Spinz BB talc is a one of kind talcum power for face which infuses the power of brightening & beauty formulae. It is an instant solution to brighten the face and focuses on common beauty challenges faced by all women such as dull skin, dark spots, marks and uneven skin-tone. The talcum powder when applied on the face offers the skin an instant glow covering spots and blemishes, making the skin even-toned along with its scintillating fragrance. A high voltage media campaign series focussing mainly on the idea of ‘Stop using regular talc for face’ across all leading media platforms for Spinz BB Talc has been rolled out. The product is currently available in the southern regions of the country at all neighbouring kirana and retail outlets. The product comes in varying sizes 100g, 50g, 30g and 10g priced at Rs.75, Rs.40, Rs.20 and Rs.10 respectively. Hair Colours (Indica), Retail Salon Products (Raaga Professional), Beverages (Maa), Dairy (Cavin’s), and Beauty Salons (Green Trends & Limelite). Most of the brands are clear winners in their respective product categories. A dedicated R&D center equipped with latest equipment and technologies constantly supports the divisions in their endeavour. Today with a turnover of over 1200 crore, CavinKare has achieved many significant milestones while acquiring a competitive edge backed by sound understanding of the dynamics of mass marketing to establish a firm foothold in the national market. CavinKare’s success is based on it being firmly grounded to its corporate mission- ‘we shall achieve growth by continuously offering unique products and services that would give customers utmost satisfaction and thereby be a role model’.